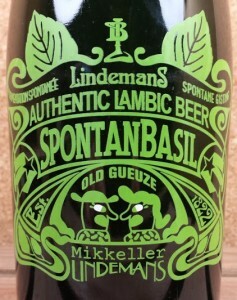 SpontanBasil is a unique collaboration between the breweries Lindemans and Mikkeller. Breaking the mold among existing beer styles, the brewers combined efforts to craft this old gueuze with a twist, based on a blend of 1 to 2 yr-old lambic fermented on oak with fresh basil-herb. Re-fermented in the bottle, SpontanBasil, bottled at Brewery Lindemans in February 2015 has a golden color and combines the sourness of lambic with the aromas and flavors of fresh basil. The ideal aperitif, also perfect for food-pairing. Every 2 years, Belgium’s original lambic breweries who are member of HORAL open their doors for an all-lambic-event. Folk can go from one brewery to another and taste the natural lambics and geuze they famously produce, whilst visiting the brewery. Since 2009, a beer was created for this event. What else than a real Belgian geuze would be justified? This specific blend contains young and old lambic by the breweries who join in the festivities. This year, the geuze is made by lambic from 3 Fonteinen, Boon, De Troch, Hanssens, Lindemans, Oud Beersel, Tilquin, Timmermans and De Oude Cam. This is the 4th brew of the beer, made for the 10th edition of “Toer de Geuze 2015”. A new label (numbered bottles) helps celebrating this fact. 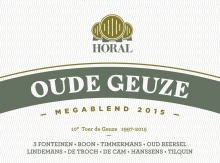 At Belgiuminabox, we now offer this piece of nature’s finest in a Horal 2015 volume deal (18 bottles, 30kg) or by the bottle: Horal Oude Geuze Mega Blend Toer de Geuze 2015.